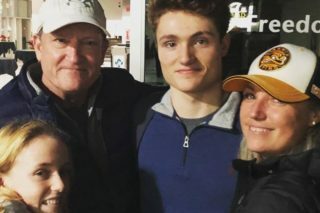 The Home Opener for the 25th Season in Sarnia Sting franchise history took place on Friday night at the Progressive Auto Sales Arena in Sarnia. The club introduced the 2018-19 edition of the Sting as well as honoured former greats in an on ice ceremony prior to puck drop. Aidan Hughes would get his second consecutive start of the season after leading the Sting to a 6-2 victory over the Saginaw Spirit in last Saturdays season opener. The Sting would come out with what seems to be a reoccurring theme, that gritty fore check, causing multiple turnovers and creating several scoring chances. However it was the visiting Firebirds who would strike first as Jacob Winterton would score his first career Ontario Hockey League Goal sneaking one past Hughes to put the birds up 1-0. The Sting would mount several scoring opportunities however could not get one past Overage Flint net minder Emmanuel Vella. The home side would take control of the game in the second period when Free agent signing Calvin Martin would get his first as a member of the black and yellow. 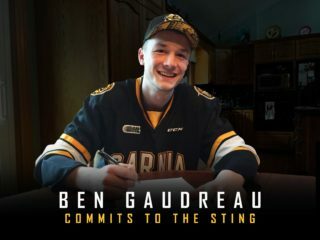 The Sting would add another just three and a half minutes later when Calgary Flames prospect Adam Ruzicka grabbed his second of this young season. Recently named captain Ryan McGregor and Overage forward Franco Sproviero would add singles for the Sting, ultimately icing this one. Vella had a solid outing for Flint making 47 saves on the evening. Sarnia is now 2-0-0-0 on the year and will take on West Division Rival the Sault Ste Marie Greyhounds tomorrow night in the second of the back to back in Sarnia. You can secure your seats online at ticketing.sarniasting.com or contact the Mainstreet Credit Union Sarnia Sting Box Office at 519 541 1717.